A more even spread of assets would improve generation flows, researchers say. 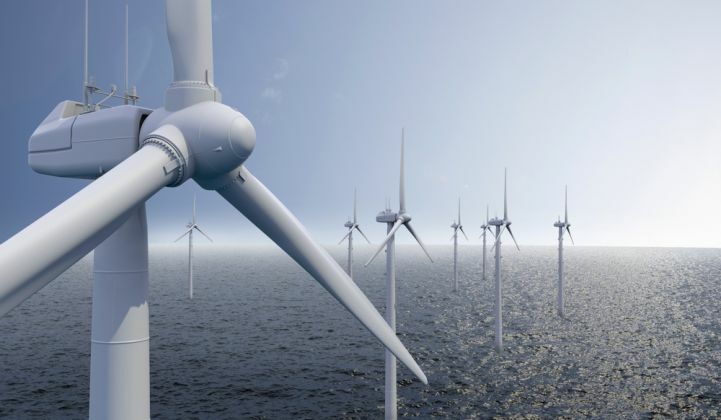 High concentrations of wind capacity in the North Sea might be good for developers but will not do European grids any favors, new research shows. Instead, according to a paper last month by researchers at ETH Zürich and Imperial College London, European policymakers should support wind development in the four corners of the continent to even out weather-related imbalances in production. “Mean generation during different regimes currently ranges from 22 gigawatts to 44 gigawatts and is expected to triple by 2030 with current planning strategies,” note the authors of the research, published in Nature Climate Change. The research confirms what we've long known: Spreading wind generation as widely as possible across the continent would help balance out the impact of variability in conditions. This would lead to more consistent levels of wind energy production across Europe. This, in turn, would make it easier to increase the proportion of wind energy on the grid without having to invest in significant levels of backup energy storage or thermal generation. “If we change where we are planning to put new wind farms, we can maintain the same level of energy output but have it come in at a much more useful time,” said one of the study’s authors, Dr. Iain Staffell, Imperial College lecturer in sustainable energy systems. Currently European wind farm development is clustered around the North Sea. This puts stress on local grids and ignores the potential of other high wind resource areas such as Finland and southeast Europe, he said. The other big problem with current wind farm distribution is that pan-European production can be significantly affected by regional gales and lulls. Being able to eliminate this medium-term variability would go a long way in helping to increase overall wind penetration across Europe, Staffell believes. Short-term fluctuations in production, meanwhile, could be dealt with using electricity storage, while seasonal variations could be solved using solar or hydro. Importantly, the study did not look at reaching a given renewable energy penetration market, but simply took European network operator predictions as a baseline for likely capacity. The research echoes previous European studies from experts such as Dr. Gregor Czisch and Dr. Björn Peters, which have tended to show how variability in wind production can be evened out by extending the region over which it is collected. This categorization makes it easier for policymakers to choose where to develop wind potential in the future. Whether they will use this information is another matter. Already, an uneven distribution of wind assets is challenging Europe’s grid infrastructure. In a recent two-day period noted in the study, changes in wind output across Europe required the equivalent of 100 nuclear reactors’ worth of balancing power. Improved wind farm distribution would not eliminate the need for balancing power altogether, but with a more optimum spacing Staffell said it could be cut to the equivalent of 20 nuclear plants, an 80 percent reduction. So far, Staffell said the research had attracted the attention of the German energy system modeling group Agora Energiewende, as well as at least one British member of the European Parliament. Staffell said greater awareness of the research could be vital in helping to remove barriers to a better distribution of wind generation. “One of the key reasons we’re not building wind farms in the southeast is that the cost of borrowing there is just so much higher,” he said.